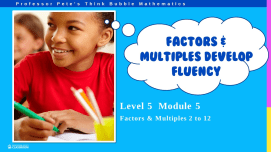 A mixture of multiplication and division facts for students who are ready to memorize all the facts to 12x12. 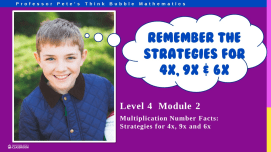 Teacher notes: How to teach the multiplication strategies. Aids in helping students remember facts and work out forgotten ones. Strategies can be applied to larger numbers in the future. Teacher notes: How to teach the division strategies. Aids in helping students remmber facts and work out forgotten ones. Strategies can be applied to larger numbers in the future. “Doubling / halving” strategy for 2x and ÷2 facts. “Place value” strategy for 5x, 10x and ÷5, ÷10 facts. “Doubles plus one more set” strategy for 3x and ÷3 facts. “Double double” strategy for 4x and ÷4 facts. “Special cases” strategy for 0x and 0÷ facts, 11x and ÷11 facts, square numbers and square roots facts. “Tens less one set” strategy for 9x multiplication facts. 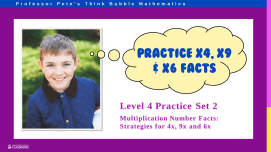 “Build from 5x” or “double 3x” strategy for 6x multiplication facts. “Double double double” strategy for 8x multiplication facts. “Build from known facts” for 7x multiplication facts. “12 is 10x + 2x” strategy for 12x multiplication facts. 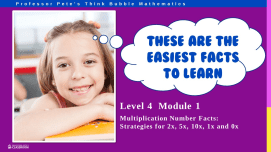 Set of 5 assessment tests to check on how students are progressing with each of the units in the Easy Multiplication & Division Facts series of worksheets. Set of 10 homework sheets to match each of the sets in the Easy Multiplication & Division Facts series. Contains information for parents.